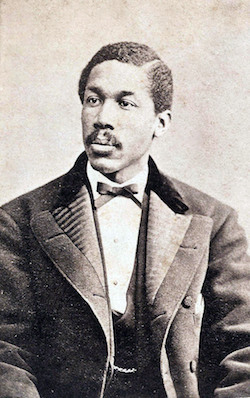 Octavius Valentine Catto was a prominent Philadelphia, Pennsylvania, activist, scholar, athlete, and military officer in the National Guard during the Civil War. Catto was born in Charleston, South Carolina, on February 22, 1839. His mother, Sarah Isabella Cain, a free woman, was a descendant of one of Charleston’s most distinguished mulatto families, the DeReefs. His father, William Catto, was a slave millwright who gained his freedom and became a prominent Presbyterian minister. The elder Catto relocated his family north around 1850 and soon became the pastor at First African Presbyterian Church in Philadelphia, Pennsylvania. Young Catto was first enrolled at the Robert Vaux Primary School and then Lombard Grammar School. When his family moved to New Jersey for a time, he entered Allentown Academy, located there. Back in Philadelphia by 1854, he became a student at the Institute for Colored Youth (now Cheyney University) and graduated as valedictorian in 1858. Catto furthered his studies in Washington, D.C., and upon his return, became an instructor of literature, mathematics, Greek, and Latin at the Institute for Colored Youth. When the Confederate Army invaded Pennsylvania in 1863, culminating in the Battle of Gettysburg, Catto responded to the call for emergency troops by raising one of the first volunteer companies, the 5th Brigade of the Pennsylvania National Guard. He served as major and inspector general in the brigade. Catto helped raise eleven regiments of “Colored Troops” in Pennsylvania who were then trained at Camp William Penn before being sent to the warfront. Even while in uniform, Catto founded the Banneker Literary Institute and the Pennsylvania Equal Rights League in October 1864. He was a member of several other civic, literary, patriotic, and political groups, including the Philadelphia Library Company, 4th Ward Black Political Club, and the Franklin Institute. After the Civil War, Catto started a Philadelphia protest movement that led to passage of the 1867 Pennsylvania law that prohibited racially segregated public transportation. Later the same year, Catto and his childhood friend, Jacob White Jr., formed the city’s second black baseball team: the Philadelphia Pythians of which he was a co-manager and a player. On Election Day, October 10, 1871, Catto was murdered along with several other blacks in a Philadelphia riot when local African Americans attempted to vote as a result of the state’s ratification of the fifteenth amendment. During the riot, Catto was confronted near his home by Frank Kelly, a Democratic Party operative who fired several shots at Catto, with one bullet piercing his heart. Kelly escaped Philadelphia after the shooting but was found six years later in Chicago, Illinois and extradited to Philadelphia for trial. At trial on April 23, 1877, six prosecution eyewitnesses—three whites and three blacks—identified Kelly as the shooter. Despite their testimony, an all-white jury acquitted Kelly. Catto never married. He was engaged to Sarah LeCount but was killed before the wedding could take place. His funeral procession down Broad Street to Lebanon Cemetery was viewed by more than five thousand people. Thirty-five years later in 1906, the O.V. Catto Lodge was formed in Philadelphia in his honor.